Every time I go I. There is yelling from the employees. They say one thing to you and then everything changes. Make me wait for 2 1/2 hours I. A room. They don’t know from their head to their *** Awful place. I will never go to any Aspen Dental again. Consumers Opinions about Dentistry ? 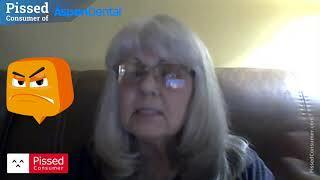 I don't believe I have enough room on here to tell you everything that I have gone through...from paying $7,000 plus to have new comfortfit dentures made and implants in my lower denture to still waiting for the rest of the hardware to be delivered so that we can wrap up. I went on 6/12/18 to have them done and was told that the other office where I started all of this had not noted what size implant they had put in (that is another horrible story) so they would order what they needed and put a rush on it...well it has been 19 days and I still don't have it done. I feel I have been lied to numerous times. I have called and ask the manager or the assistant that was helping me to call me and they don't do it. I finally got in touch with the manager and he told me he would contact me at they end of the day to let me know what was going on...again...didn't happen. The last call said they didn't get everything they needed and would call when they got it. Not holding my breath! 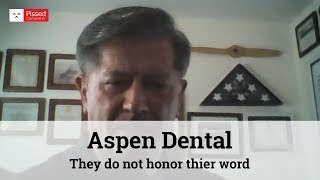 I will certainly tell anyone I can that they should not use Aspen Dental. I feel like I have thrown $7,000 down the drain! My name is Vicky Land and the 2 offices I have used are in OKC on Memorial and Stillwater, OK. What a rip off!!! You know there's something wrong with this place and I just can't place my finger on it other than the book too many appointments and they never finish one job at any one appointment and they always take new x-rays of your entire mouth even though you just had some taken in my case the day before at a different Western dental but the service was so bad there that I left and went to the Santa Cruz store I've been dealing with them for three years now and I finally just can't take it I need a crown my tooth is cracked I applied for and got $5000 in care credit so I can get it fixed, they said they had to send for approval to get my teeth cleaned since I've got denti Cal for that that was weeks ago, so I called the state to find out what was going on they said yes they did get a request but they had to deny it because the x-rays worked in the request like it was supposed to be this is Western dental they should know the x-rays have to go in with the request so I've been waiting three weeks for this answer so I call up the store and the persons busy because they have a specialist in today or they had an emergency or this or that they keep promising to call back but they don't I don't know what else to do I got $5000 to spend at this place and I can't even spend I can't get a call back their business practices are just horrible yet they seem to be always busy. 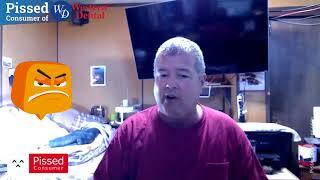 It's not the good old dentist customer service that used to get that's for sure I guess that's what Western dental is about I don't know the people seem to be nice and friendly especially on the phone but I can't get them to answer back so I'm leaving Western dental after three years.